my dog(Milly) and 123cosmo4's dog (Mo). . 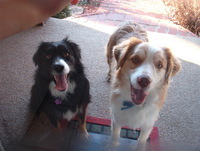 Images in the Hunde club tagged: dogs cute australian shepherds. How lovely,The first one(is it milly? )looks like my dog Zac.He is a rescue dog.